Skinlite cream (Hydroquinone 2%/Tretinoin.025%/ Mometasone Furoate 1%) is a triple combination skin lightening cream used to treat hyperpigmentation on the skin using three of the most effective skincare ingredients available. 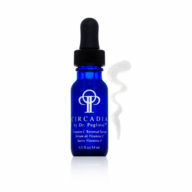 Its mechanism of action is reducing the amount of pigments such as melanin. This helps to lighten unwanted areas of darkened skin, including melasma (due to sun damage), chloasma, freckles, age spots and senile lentigines. Hydroquinone is a compound widely used in cosmetics for its ability to decrease the skin color, leading to whitening. By affecting the synthesis of the pigment melanin, it can gradually bleach the skin, thereby treating unwanted dark spots. 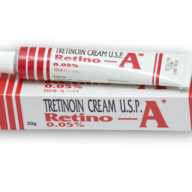 Tretinoin (a type of vitamin A also known as retinoic acid) is frequently used in dermatology. 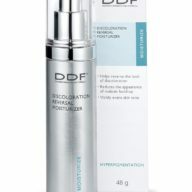 It helps to increase the penetration of hydroquinone through the outer skin (stratum corneum), while also preventing the oxidation of hydroquinone, thereby enhancing its effects. In addition to this, it may also improve the rate at which the pigment is removed due to the fact that it increases the turnover rate of keratinocytes, while also helping to reduce the appearance of some fine wrinkles. 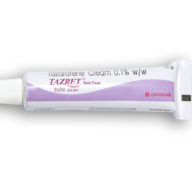 Finally, mometasone furoate is a mild corticosteroid is added for its anti-inflammatory properties. It helps to lessen inflammation on the skin. 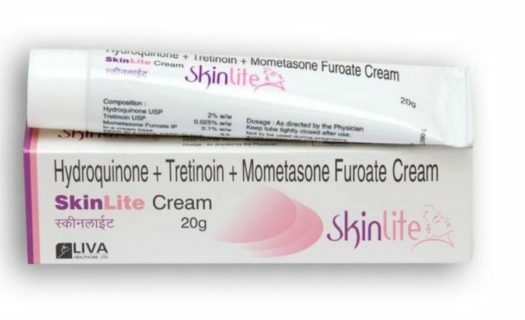 Skinlite cream is intended for application directly to the area of skin that is affected by hyperpigmentation on a daily basis, until areas affected are improved. Treatment of hyperpigmentation with Skinlite cream may trigger some side effects including: skin redness, irritation, burning/stinging sensation and/or dryness. Contact your physician if any extreme side effects manifest. Skinlite cream is for external use only. It must not be taken by mouth nor should it be allowed to come into contact with the mucus membranes. Do not allow the skin to be exposed to UV light during treatment, as doing so will cause the bleached areas of skin to become darkened. This cream should not be used by women who are pregnant or breastfeeding. 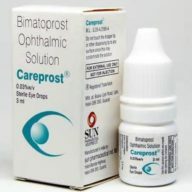 This product is intended for relatively short-term use and should be used very sparingly. *Note: the primary difference between Skinlite cream and the Triglow cream is the weaker dose of tretinoin (.025%) in this product, making it more suitable for sensitive skin. Also, this is manufactured in a larger (20g) tube. A better value!